Lawyers for Jeffrey MacDonald are again seeking a new trial, citing new evidence that discredits a government witness. In a motion filed last Thursday, MacDonald’s lawyers argue that a judgment filed last month by a U.S. District Court judge should be amended based on a Department of Justice report released that same month. They also argue that MacDonald should be able to appeal that judgment to a higher court. MacDonald, 70, is serving three life sentences for the February 1970 stabbing deaths of his pregnant wife, Colette, and daughters Kimberley, 5, and Kristen, 2, in their home on Fort Bragg. A former Army captain who served as a doctor for a Special Forces unit, MacDonald was convicted following a seven-week trial in 1979 but has long contended that he and his family were the victims of a home invasion. He said he woke to find three men and a woman in his home and fought with the trio – described as “drug-crazed hippies” – before being knocked unconscious and stabbed once. Investigators said MacDonald killed his family and made up that story. Last month, Senior U.S. District Court Judge James C. Fox ruled that MacDonald’s lawyers failed to establish that he shouldn’t have been found guilty of the murder of his wife and two daughters. Fox also said MacDonald’s lawyers failed to establish the merits of new evidence presented at a seven-day hearing in September 2012. As part of his 169-page order, Fox also denied a certificate of appealability, leaving the future of the case in question. In the recent motion, MacDonald’s lawyers said the DOJ report calls into question a former FBI investigator who worked on the MacDonald case. That former investigator, Michael Malone, testified that synthetic hairs found in the MacDonald home most likely belonged to a doll. MacDonald’s lawyers had argued the hairs bolstered MacDonald’s account of the attack that killed his family – that the hairs belonged to a wig worn by one of the attackers. MacDonald’s lawyers said they were unaware the federal government was investigating Malone. “The Department of Justice and FBI spent the last several years reviewing Michael Malone’s work-product and trial testimony to determine whether Malone provided invalid, unreliable, or false hair identification testimony,” according to the motion. MacDonald’s lawyers said the DOJ report was not considered by the court in making its decision. “We concluded that the Department should have directed the Task Force to review all cases involving Michael Malone, the FBI Lab examiner whose misconduct was identified in the OIG’s 1997 report and who was known by the Task Force as early as 1999 to be consistently problematic,” officials said. The report said Malone’s “faulty analysis and scientifically unsupportable testimony” helped convict a man who was exonerated 27 years later and led to the reversal of at least five other convictions. Malone retired from the FBI in 1999, but later performed background investigations for the bureau as a contract employee. The FBI stopped associating with Malone in June, according to the DOJ report. Colette MacDonald had 37 stab wounds – some from an ice pick, some from a knife – and was beaten. She had two broken arms and a fractured skull. His older daughter had a fractured skull and eight to 10 stab wounds. His younger daughter had 27 stab wounds. Since his conviction, MacDonald has made repeated attempts at a new trial or to have his convictions overturned. The case has long captured the nation’s attention. It was the subject of the best-selling 1983 true crime book “Fatal Vision,” which was turned into a television miniseries of the same name. Dear friends,WantToKnow.info recently received an excellent update to the below revealing email sent to us on April 20, 2004. Both the original email and the update were written and sent by Bob Kirkconnell, a courageous career military man who describes here how he personally witnessed a very large-scale drug smuggling operation which likely involved rogue elements of the US government and military.Shortly after receiving his initial email, we put Bob in touch with Mike Levine, a 25-year veteran of the DEA who also personally witnessed large-scale drug smuggling by the government. After his whistleblowing, Mike became a target and had to go underground several years for his own safety. Read the beautiful story of what happened after Mike and Bob connected below.SInce 2004, Bob has researched this case deeply and found lots of highly revealing information to support his claims. His updated comments sent Nov. 10, 2012 are interspersed between paragraphs of his original message with italics and indenting to distinguish these more recent findings. He also gives a key quote from a book by a Wall Street Journal front-page editor supporting his claims. At the end of this email are empowering suggestions for what you can do to make a difference. And for a great book Bob wrote on this event and much more, click here. Email from Bob Kirkconnell To WantToKnow.infoI am Bob Kirkconnell, a retired Air Force chief master sergeant. I spent 27 years on active duty, and now teach high school. I was involved in an investigation of heroin smuggling into the US using killed-in-action human remains out of Vietnam. This happened in 1972 or 1973, and since then I have been looking for any information that would explain the whole picture. Your web site is the first info I have been able to find in over 30 years. Update, Nov. 10, 2012: I retired from teaching in 2010. This case was investigated by the Air Force Office of Special Investigations in December, 1972. Since writing the above, I have found other connections to this case, one of which was Green Beret captain and physician Jeffery MacDonald. He was investigating heroin smuggling in G.I. corpses at Ft. Bragg, NC when he and his whole family were attacked by a gang of drug users. He was the only survivor with 17 stab wounds, three of which should have been fatal. Strangely, MacDonald was charged with the murders. He is now in jail appealing his case. One of the witnesses, Helena Stoeckley, stated that Thomas Edward Southerland was involved in this case also. These so-called “Fatal Vision” murders happened in 1970. I was an Air Transportation Supervisor in those days stationed at Kadena Air Base, Okinawa, Japan. One day we had an Air Force C-5 come in that was only scheduled for a few hours servicing (intransit), and then to continue on to Travis Air Force Base, California. This plane contained between 80 and 90 transfer cases (87 is the number I recall) containing human remains, killed-in-action, out of Vietnam. When it arrived, the plane broke, went into maintenance, and we had to order parts that would take over 24 hours to receive. Update, Nov. 10, 2012: The 80 to 90 figure I stated above is likely to have been inaccurate. I do not recall the exact figure, but I do recall the master sergeant I worked for briefing me that “The whole shipment had been gutted and stuffed with heroin.” It is possible that the above figure was a rumor that stuck in my memory, but the source did not. I checked with the National Archives and the total number of war dead for 1972 was 759, so it is highly unlikely that the number I stated in 2004 was accurate. On intransit aircraft, Japanese customs did not get involved unless the plane was going to be on the ground more than 24 hours. This was the case with this C-5. After the plane was fixed we noticed that the two couriers for the human remains could not be located. This was highly unusual. One of the couriers was an Army major and the other was an Army master sergeant. We started looking for them and notified Japanese customs that something was very suspicious. We discovered that the master sergeant had taken another flight to Hawaii. The name he was traveling under was Sutherland. We never did find the major, and I do not recall his name. Update, Nov. 10, 2012: The proper spelling of the master sergeant’s name was Southerland. This had to have been Thomas Edward Southerland, who was tried in a Baltimore Md. Federal court in connection with this case in 1973. This case was also written about in a Time magazine article, January 1st, 1973 edition, and the name given for the suspect was Thomas Edward Southerland. The federal attorney who prosecuted the case was Michael Marr. He is now in private practice in the Baltimore, Md. area. I contacted him via e-mail a few years back and he said that he remembered the case well and that if I had questions about the case to “feel free to ask” him about it. I had several questions that I did ask him, but he did not reply. I tried several more times to contact him but never got a response other than the first one. I am pretty sure that the rank of the other person who disappeared was captain, not major. I still do not recall his name, but I remember it being of French extraction. Japanese customs opened the transfer cases and found that all of the bodies had had their internal organs removed, and that they were stuffed with bags of pure heroin. An Air Force Office of Special Investigations, OSI, agent contacted me and told me "not to release any documents pertaining to the incident to anyone but him." One of my responsibilities was for processing and storage of all cargo and passenger documentation. He told me that he would let me know what he needed at a later date. I passed this info on to my people that worked the night shift. That night an Army investigator from Criminal Investigations Division, CID, came to the records section and demanded these records. He threatened to put our personnel in jail for obstructing an investigation, etc. The shift supervisor refused to give him the records, and eventually he went away. Update, Nov. 10, 2012: The master sergeant I reported to briefed me that Japanese customs officials had been alerted by passenger reservations personnel that the couriers could not be found for the human remains shipment and that this was highly unusual. I have tried to locate the above master sergeant but have been unable to find him, nor have I found a record of his death. Master Sergeant Sutherland (this was an alias) was apprehended in Hawaii a few days later, and was charged with several offenses. He was tried in a federal court in Washington, DC, and one of our captains testified at the trial. The OSI agent in Okinawa came to me before the trial and signed for all related documentation (orders, aircraft manifest, etc.). He sent this via US registered mail, signature service required, to the federal prosecutor in Washington. Update, Nov. 10, 2012: Again, the name was “Southerland.” I have discovered that this name was not an alias, but was this person’s name of record. According to Time Magazine article, Jan. 1, 1973, Southerland was apprehended at Andrews A.F.B., Md. Terminal Reservations personnel told me that Southerland had flown from Kadena A.B., Japan, to Hickam A.F.B., Hawaii, on his orders that had “variations authorized” typed in them. This meant that he could change his destination and take a military flight to any location. When a military person varies their destination through Passenger Terminal Reservations and flies on their orders and not a Military Transportation Authorization, my office would not have had a copy of the orders. The orders would have been retained and filed at Reservations, so I did not see these orders. Southerland maintains that he was traveling on falsified leave orders, but this was not what I was told. The prosecutor, Michael Marr, referred to travel orders in this case and not leave orders and the difference is important. Leave orders would not have linked him as a courier for human remains but official travel orders would have. My understanding was that he was traveling on orders issued by the 5th Army Field Hospital in Thailand, but I cannot state that as a fact. The evidence never got to the court. I know this because I was concerned that the records needed to be returned to the files, and I inquired about them about once a week. The OSI agent eventually told me that the records had disappeared and signed a statement that the documentation was missing and could not be returned. I put this in the files. He also told me that Sutherland was convicted of only one charge--unauthorized wear of a US military uniform. None of the other charges were proven because of lack of evidence. He also told me that Sutherland was not his real name, and that he and the major with him had never been in the Army. Update, Nov. 10, 2012: As before, Southerland was the spelling of the name, and the rank given as major was a captain. Apparently Southerland was charged with more than one offense having to do with illegal travel on military aircraft and illegal wear of a military uniform. I found no evidence that he was charged with any offense having to do with drugs or smuggling drugs using bodies. I knew this OSI agent because I had researched several other cases of drug smuggling on military aircraft. I usually did not ask him questions which I thought he was not at liberty to answer. He always told me everything that I needed to know to research illegal activities. Most of the cases were relatively small-time drug smuggling. This case was something that was way over-the-top. All of us that knew the enormity of this case were flabbergasted. The forged documentation was flawless and had to have been done by experts in the air transportation field. Also, our people who saw the two impostors said that their uniforms and ID cards were perfect.Further, when we talked about this, we were astounded with the enormity of this operation.The mortuary in Vietnam had to have put the heroin in the bodies, and the one at Travis Air Force Base, California had to remove the heroin, and it had to be distributed, ID cards had to be obtained, orders had to be made, etc. This was no smalltime operation. Update, Nov. 10, 2012: One of the lingering questions is where these bodies came from, and what port was their destination? I assumed that the bodies had to have originated at either Da Nang Air Base, South Vietnam, or Ton Son Nhut Air Base because these were the only mortuaries in Vietnam at the time. I have discovered, however, that the 5th Army Field Hospital near Bangkok, Thailand, was taking over the handling of Vietnam fatalities because the two in-county mortuaries were closing. It is possible that the bodies came from there. Prosecutor Michael Marr stated to the press that Southerland was wearing Army medical insignia on his uniform. If true, this leads one to seriously question how this could simply be a coincidence. I also assumed that Travis Air Force Base, CA, was the port of debarkation because it had the only military mortuary on the West Coast. This, however, might not have been the case. I never forgot this event and it changed the way I looked at things from that time on. I recall hearing Maxine Waters, Congresswoman from California, talk about the FBI dumping enormous quantities of heroin in the inner-cities to destroy the social fabric of black communities. I also think about the fact that about one-third of African American males have criminal records and cannot vote in many states. And then there was Iran-Contra that involved cocaine smuggling. I wonder about the so-called "War on Drugs." Maybe it is really a war against African Americans. I also notice that Afghanistan has a bumper crop of opium, and I wonder if that might have had something to do with our invasion and the Northern Alliance taking over much of the country. Finally, I have never been stationed on an Air Base that I didn't suspect was being used for drug smuggling. Update, Nov. 10, 2012: In the years since writing this letter, I have found substantial evidence that the above suspicions are based in fact. As the late author Gary Webb explains in detail in his book Dark Alliance: The CIA, the Contras, and the Cocaine Explosion, there is much more to drug smuggling than what we are seeing in the news. There is also evidence that minorities are being targeted. For example, the mandatory jail sentences for crack cocaine, used mostly by African Americans, is in most localities about six times that of powder cocaine, mostly the choice of white Americans. "The Chang Mai ‘factory' that the CIA prevented me from destroying was the source of massive amounts of heroin being smuggled into the US in the bodies and body bags of GIs killed in Vietnam. Case after case was killed by CIA and State Department intervention, and there wasn't a thing we could do about it." You can read more about this on our website at this link. Bob and Mike eventually had a deeply moving radio interview on New York's WBAI on June 21, 2004, titled "The Vietnam Body Bag Case." Mike later wrote me an email saying: "The show on the body bag case was very emotional to both of us. We were both loyal servicemen whose notions of [our government's integrity] were crushed ... and the show is the very first time real witnesses to those horrific events came together to compare notes. Anyone who hears the show will most certainly be affected." Those who would expose such evil and wrongdoing get accused of trumped-up crimes and/or are nearly murdered [in this case having their entire family brutally murdered by the State Intelligence and/or Military apparatus - and falsely accused of having done the same - while stabbing himself nearly to death]; those who committed these sorts of crimes for years and years and carved up bodies in which to hide their 'stash' get another yacht, house, numbered bank account, Leer jet, etc. Sick world.....This is one event the 'media' never touched...too hot and too much against the Religion of America and its 'exceptionalism'. 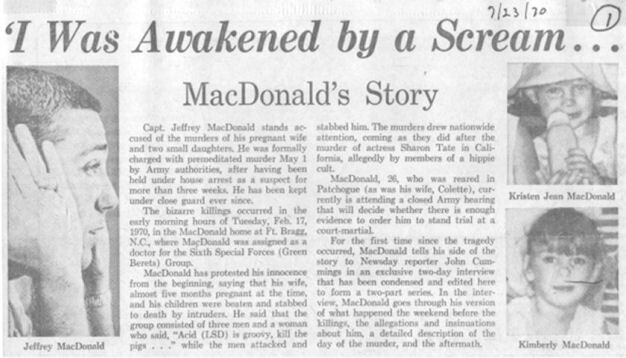 I was a part of the investigation into the body bag case in 1972, but I didn't know that it was connected to the MacDonald case. Researching the book I wrote about it, I came across information that could not be a coincidence. One was the name of a guy who was prosecuted but not convicted in the case I was involved in. I found the same name in the MacDonald case. I don't believe MacDonald was guilty of anything except coming across something very dangerous and trying to do something about it. That MacDonald stumbled over something terrible would explain why the government has been so gung ho to refuse to investigate his evidence that he is not the killer. Poor man. Last edited by Dawn Meredith; 01-01-2019 at 09:23 PM.